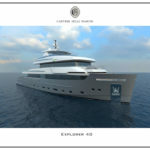 Begallta, is the 75mdeveloped by CRN in partnership with Lobanov Design, who created the exterior lines and spatial layout, and Pulina Exclusive Interiors, who crafted the interiors. 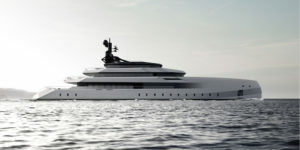 Begallta’s silhouette captivates the eye with its modern design, exemplified to perfection by the tapered bow, which slices through the water’s surface when under way.The yacht’s unique stylistic hallmark is the line that slants along the hull and superstructure like a ribbon, seamlessly uniting her decks and lending an unprecedented sense of fluidity.The Begallta’s futuristic inspiration reaches its zenith at the stern, where the cut of the corners underlines the yacht’s highly distinctive style. “Creating iconic yachts that etch themselves into the imagination at first sight is what our design approach is all about.The constant quest for dynamic, ingenious, original solutions that instantly express a precise idea through the use of different styles is integral to our way of working, alongside the imperative to bring the unexpected to life.This project fully articulates our values and our style.We are pleased to have worked with CRN on what has proved a fascinating intellectual challenge for our studio”, addedIgor Lobanov, Creative Director at Lobanov Design.